The student came over my walkie talkie sounding pretty stressed. “Bill, can you come in here, the console is on fire”. That got my attention. I raced to Control Room B and yep, it was filling with acrid smoke from the ceiling down to about shoulder height. There wasn’t any fire yet, but it was clear we were only minutes away from disaster. I ran upstairs and threw all the breakers on the SSL 4000 power supply. Or so I thought. In my hurry, I missed the 263v plasma meter supply. I quickly found that out when I ran downstairs and stuck my hand into the area of the console that was smoking badly. I got hit with a jolt that hurt to my toes. It was clear that this console needed a break. This was the third near-fire. It had served Omega well for thirty years. It was well maintained, but as everybody who knows SSL consoles is aware of, once the high voltage meter bridge starts breaking down, it will need a major rebuild. However, in a studio that is booked nearly every day for months on end, access by the maintenance crew is a real issue. Rebuilding all the high voltage meters was just too big of a job to attempt in between sessions. We determined the console had to come out and spend some quality time in the shop to be repaired. Another console needed to take its place in as smooth and seamless a manner as possible, so as not to interrupt the ongoing sessions and classes in Studio B. At this point we were faced with a decision. Should the facility that was both a busy Studio and a renowned Audio Engineering School, move to a smaller, digital or hybrid analog/digital console design, or stay with a large format analog design? A new console would be easier to install and maintain, but would lack the sheer joy of a 70+ channel analog SSL. On the other hand, any used console could potentially present the same issues as the one it was replacing, so choosing the next console wisely was of paramount importance. For owner Ed Petersen, (Pete), there was no question though. 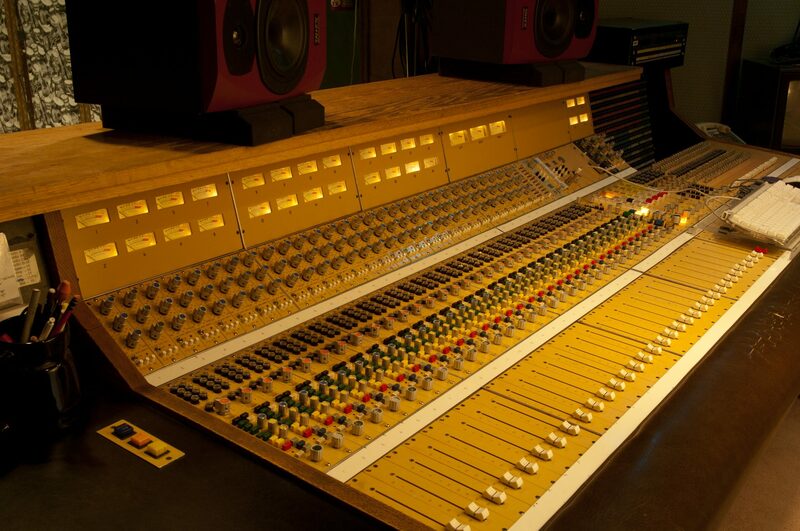 We needed the biggest and best analog console ever created by SSL, an SSL 9000. Woo hoo! But purchasing, installing and maintaining a large format analog console is not for the faint of heart. These consoles have upwards of 15,000 moving parts that must be maintained to a high degree of accuracy and reliability. Plus, the SSL has some of the most sophisticated analog electronics ever created, and some very custom, hard to find components. Again, not for the faint of heart. The search took us to Europe, the Far East, and back to the US. But before we go there, a little history of this terrific SSL 4048 is warranted. I asked Bob Yesbek, the owner of Omega Studios at the time of the arrival of the SSL 4048, to give us some early historical account of his time with the console and pasted it below. CAPTION: Omega Studios’ founder Bob Yesbek (right) told staff and clients that he was going to New England to “drop a few bucks” on a new console for Studio A. In the photo, he is doing just that in Normandy Studios’ main control room, along with Omega’s chief engineer Billy Brady. After the 1985 consolidation of the three Omega Studio locations (Kensington, MD., Washington, DC, and Sharon, VT) into the present Rockville, MD complex, it quickly became apparent that more inputs were needed in Studios A and C of the new facility. The API-2488, though (to this day) still in demand for its iconic sound, simply could not handle the larger sessions that were regularly booking into Rockville’s Studio A. So the plan was to purchase another world-class console for Studio A and move the API into Studio C, keeping the 32-input MCI-JH-632 console from the Washington, D.C. Omega facility in Studio B. In our search for an SSL-4000-E console with the E-series EQ we desired, we connected with Phil Greene, owner and operator of Normandy Sound in Warren, RI. Phil owned and operated Normandy for 24 years – recording and/or mixing 67 chart albums, 27 gold and platinum albums, ten Top Ten hits, three #1 albums, nine Top Ten singles (six of which reached #1) – resulting in total sales of over 70 million records. The SSL-4000-E of our dreams was the centerpiece of Phil’s star-studded control room. The most recent album to grace that console was New Kids on the Block’s 1988 ‘Hangin’ Tough’ album which sold over ten million copies in the U.S. and thirty seven million copies worldwide. Though Normandy eventually closed in 1999, Phil Greene continues to be instrumental in the popular music industry at Triad/Normandy Sound in Warren, RI. The mainframe of the SSL-4000-E was so large that one of the huge picture windows in the front lobby of Omega Studios had to be removed by a team of 6 professional glazers – and immediately replaced as soon as the console was craned through the window frame. It was too long to make the turn into Control Room A, so another crew of carpenters had removed the entire Studio A door structure in order to get the mainframe into the room. With just an inch or two to spare, it was jockeyed into Control Room A through the iso booth to be reassembled and wired into the system. While the console was inching its way into Control A, the carpenters were rebuilding, securing, staining and painting the studio door structure to its original specifications. Next: The SSL 4048 at Omega.